Washington, D.C. – January ­­29, 2015 – Achieve’s ninth annual “Closing the Expectations Gap” report, released today, shows the progress that states have made in advancing college and career readiness while also revealing that much work remains to be done to ensure that all students are academically prepared to succeed in college and careers after high school. Standards: All 50 states and the District of Columbia have adopted K-12 mathematics and English language arts (ELA) standards aligned to the expectations of colleges and careers. As implementation of these standards continues in classrooms across the country, success hinges upon the provision of time, support, training, and aligned instructional materials to teachers and principals as well as the use of strong performance metrics to monitor progress. Graduation Requirements: As of 2014, 23 states and the District of Columbia have raised their high school graduation requirements in mathematics and ELA to the CCR level. Ten of these states and the District of Columbia have established a mandatory CCR diploma, while the remaining 13 states enroll all students in the “default” CCR course of study but allow students to opt out of the requirements or to modify a course or courses with parental permission. More than half of states have yet to take steps to align the courses or content students are required to take with their standards. For the implementation of CCR standards to be meaningful, students must be required to actually be exposed to all of the states’ mathematics and ELA standards in order to receive a high school diploma. 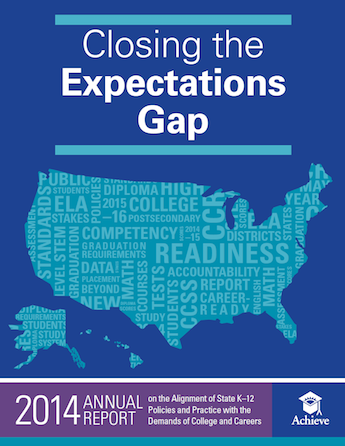 States’ failure to align graduation requirements with the expectations of colleges and careers was demonstrated in Achieve’s 2014 survey of recent high school graduates; only one in four reported that their high school set high academic expectations, and those students were more than twice as likely to feel well-prepared for their next steps as those who reported that their school set low expectations. As states implement CCR expectations, they also need to clearly and publicly report how many of their students are not just graduating, but graduating college and career ready. Few states know how course-taking patterns differentially prepare students for their next steps after high school. Assessments: This year, 36 states are administering an assessment capable of generating a score that reflects students’ readiness for first-year credit bearing courses in mathematics and ELA. In nearly all cases, these states are members of the PARCC or Smarter Balanced consortia or are administering the ACT or SAT. Additionally, seven states indicated that they are instituting policies that formally link their high school assessments’ CCR determinations to postsecondary placement decisions; 20 additional states have plans underway to ensure high school assessments are valued by postsecondary systems in states. Accountability: Today, 37 states and the District of Columbia publicly report or include in their school accountability formulas at least one of four accountability indicators that Achieve has identified as critical to promoting college and career readiness. No state meets Achieve’s criteria regarding the use of all indicators in its accountability system, but two states (Hawaii and Texas) now publicly report school-level data on each of the four indicators. As a supplement to this year’s report, Achieve has created four resources detailing which ELA/literacy, math, and science assessments states will administer to all students in grades 3-8 and high school in 2014–15, as well as how the state plans to use the assessments (i.e., to evaluate schools and districts, as part of a teacher’s evaluation, student stakes) and one table that includes states’ graduation requirements in math, ELA, and science. These resources, all of which are available on Achieve’s website at www.achieve.org/ClosingtheExpectationsGap2014, will be updated throughout the year as states’ policies evolve. This current school year and the next several years will be particularly critical to the CCR agenda. It is crucial that state leaders remain firm in their commitment to adopting and implementing CCR policies and resist the political expediency of being less transparent and lowering expectations for students.